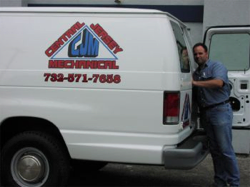 In business since 1993, Central Jersey Mechanical, Inc. has experienced steady growth and expansion. Today, we are a successful plumbing operation employing over 30 qualified plumbers. As a result, we have a diverse customer base with many requirements. In order to continue serving our established customers and further develop our residential clientele, we now operate CJM Service Division focusing on all aspects of maintenance and repair. Please contact our fully-staffed office for any and all your plumbing needs. Copyright ©2001 Central Jersey Mechanical, Inc.